Pakistan’s army chief accused India’s intelligence agency of undermining the multi-billion dollar China-Pakistan initiative. On Tuesday, Pakistan’s powerful chief of army staff, General Raheel Sharif, accused India of actively seeking to undermine a multi-billion dollar Chinese infrastructure investment initiative in Pakistan. 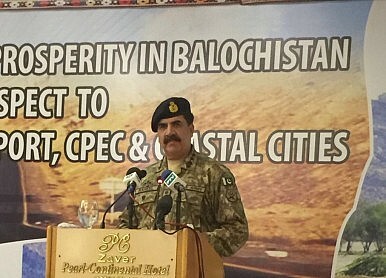 Discussing the security of the $46 billion China-Pakistan Economic Corridor (CPEC), General Sharif said that “India, our immediate neighbour, has openly challenged this development initiative.” The general delivered the remarks in the port city of Gwadar, an important terminal node for CPEC. I would like to make a special reference to Indian intelligence agency RAW (Research and Analysis Wing) that is blatantly involved in destabilising Pakistan. Let me make it clear that we will not allow anyone to create impediments and turbulence in any part of Pakistan. Therefore, it is important for all to leave behind confrontation and focus on cooperation. General Sharif has recently been focused on possible Indian espionage in Balochistan. During a recent state visit by Iranian President Hassan Rouhani, a spokesperson for the Pakistani military noted that Sharif had raised the issue, effectively implying that Iran had abetted Indian espionage. In addition to the Yadav episode, Sharif’s remarks also come within a week of scheduled peace talks between India and Pakistan being suspended. Pakistan’s high commissioner to India, Abdul Basit, said the Comprehensive Bilateral Dialogue between the two countries was suspended following a Pakistani investigative team’s visit to the Indian Air Force base at Pathankot, where Pakistan-based terrorists had staged an attack in early January 2016. Pakistani anxiety about Indian espionage in Balochistan centers around the deep-water port of Gwadar, which is the southernmost node of CPEC, giving China effective access to the Arabian Sea and Indian Ocean. As General Sharif spoke on CPEC, Zhang Baozhong, the head of China Overseas Ports Holding Company, the Chinese state-owned company in charge of operations at Gwadar since 2013, told Reuters that the port was nearing operational completion. Zhang sees Gwadar becoming fully operational by the end of the year. Meanwhile, also on Tuesday, representatives from Afghanistan, India, and Iran finalized a draft agreement to develop the Chabahar port in Iran. India has sought to use Chabahar as a point of entry into Afghanistan, which is otherwise geographically cut off from India for land-based trade given India’s limited cross-border trade with Pakistan. According to Tolo News, several senior ministerial representatives from the three countries met in New Delhi. In addition to helping inbound Indian investment into Afghanistan, the pending Chabahar agreement between the three countries would also allow Afghan exports to access global markets through a route less dependent on access to the Pakistani port city of Karachi. India’s Quint published and deleted a story alleging that Jadhav was indeed spying for India. What does that tell us?